I think I have it a bit better looking now. Considering you have never owned an ///M, this looks very accurate. Except the "Club 6MT bit". You have photoshop skills but no driving skills. Footie has once again managed to unleash T-bone upon himself, this time with the M-DCT hat photo, so I can't request T-bone to leave this thread alone on this occasion. However, in order to keep T-bone from posting disturbing images of hairy men running around in bikinis here as well, maybe Footie and T-bone should take this outside and settle things like real men by putting on a mud wrestling show? Do people want an official logo, or should everyone go with whatever they want? I actually will not use the logo as an avatar once my car arrives (I'll use a pic of it instead). I am thinking more in the lines of a sig, but that's just me. OK. We could group similar images in categories, and vote for a category as opposed to a specific image. Then one can choose an image from the winning category. Would people be okay with that? I think there should be one official logo. Other designs can always be implemented for stickers, shirts, etc. Are the m-dct people copying our every move? I just noticed some "club M-DCT" logos that look similar popping up. I don't know if this is better or more accurate please tell me. 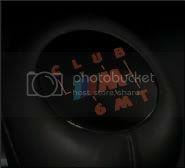 I have always preferred manual transmissions so it was the only real choice for me. I respect the advances that have been made with the manual automatics, and generally concede they are in fact faster than the full manual, but they are not for me. I prefer the level of driver involvement that the full manual brings, and I also favor the mechanical simplicity and lighter weight of the 6MT, along with the fun factor of having full access to the engine's revs at all times via the clutch. The red one is more accurate then again the last time I had a 6MT in a ///M car was the E36 M3. I think that portions of this should be used in fathering our club's mission statement. That's really good. I think the M in the middle is also red like on your previous design. I will fix that for you and hopefully this might be accepted as the group sig. It would be nice to have been useful from something. I went to the dark side with an SMG equipped 2002 M3 but have seen the light and promise never to be shiftless again. May I join? You're in and we'll even waive your membership fee given your traumatic experience! Taking everything everyone has to say about the lit gear knob, what do you think of this one.